Tarpans are a now extinct wild horse from Russia. The last two on the planet died within a decade of each other in the late 19th century. Essentially the Tarpan is one of the few wild equines that existed during prehistoric times and they are thought to be the ancestors of most modern breeds that come from the Russian Steppes. Originally they were found throughout Eastern Europe and western Russia and became the foundation stock for many civilizations along the eastern Mediterranean. For thousands of years they were a mainstay in many cultures and their blood is a part of a wide variety of modern breeds. They were hunted to extinction in a similar manner as the modern Mustang is today in the western US. Land was needed for farmers and wild herds used up precious resources, they were also hunted as a source of meat. 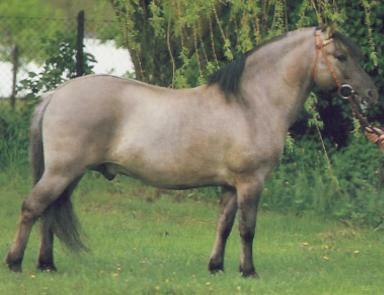 Today there is close genetic recreation of the Tarpan, also called the Heck Horse. Once Tarpans were gone, the Polish Government decided they needed to do something about it and they began collecting animals that resembled Tarpans. Many of them were Konik horses which are closely related cousins of the Tarpan. They used selective breeding practices to recreate the breed’s genetics as closely as possible. The Heck brothers, who were zoologists and directors of the Munich Zoo, also took on the project and were able to somewhat faithfully recreate the breed as well. In the end, it is impossible to re-create a species that goes extinct, but the efforts of both teams were admirable. It is acknowledged that the Tarpan of today is not a pure descendant and those that were created by the Heck brothers are often called Heck Horses to differentiate (and pay homage to two brothers who wanted to bring the Tarpan back). Today most of the new Tarpans are owned by private enthusiasts or zoos. Tarpans are calm, friendly, and curious. They are around 13 – 13.2 hands high. Their head is long and broad with a straight or convex profile. Their ears are long, pointed, and fall slightly sideways. Their eyes are small and round. Their neck is thick and short. Their back is long and straight. Their shoulders are sloped and long. Their legs are long and slender, but strong with broad joints. They always are a shade of dun with primitive markings.